This month we have the privilege of talking with the incredible Floral Artist Emilia Spencer-Brown of Bloodwood Botanica. Emilia creates the most breathtaking creations that are so full of thought, drama and sentiment for each wedding that she does. 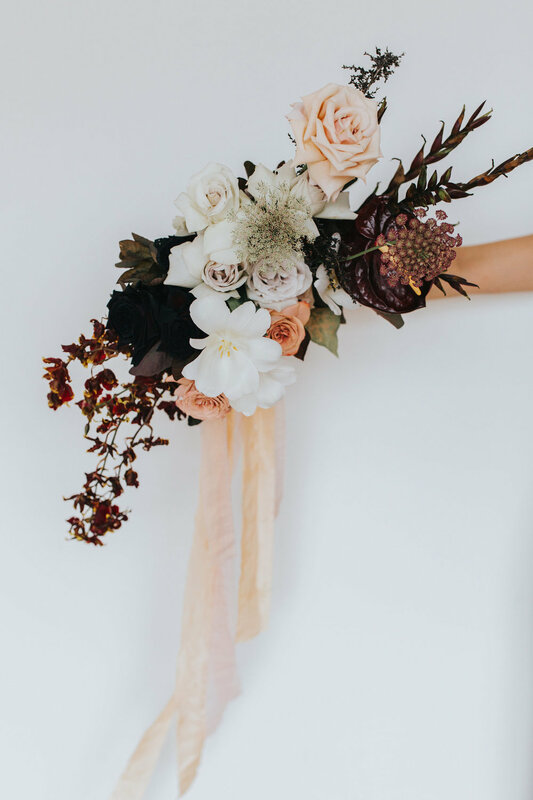 We are thrilled to have picked her brain about ways to be brave when it comes to your wedding day flowers. Emilia, tell us about how you approach the direction of wedding flowers with a bride? Do you start with a colour for example? I like to start by hearing what the couples ideal wedding looks like. Removing their constraints of what they can afford or what is physically possible, I want to know what the day of their dreams looks like. This helps me get to know what is important to them, not just within the flowers but in their life together. It can sometimes get a bit off topic from floral design, but I find it really helps to shape the overall design and create a look that reflects the couple. How involved should a bride be throughout the process with you? This is so dependant on the bride/groom. Everyone is so different. My goal is make them feel comfortable and have creative trust with them so that they are confident I will create something that will be truly breathtaking. Tell us about how a floral sculpture can elevate a wedding? The aim when creating a floral sculpture for a wedding is to make something that will take peoples breath away. They bring an indescribable magic through a multitude of senses. Elegance, beauty and art through their every unique stem and petal, an intoxicating freshness to the air... they take everything to the next level. What are your favourite flowers to use in wedding arrangements? I have too many to count, however I do find myself most often gravitating towards a few of my favourite orchid varieties. It seems there's always a surprise favourite that presents itself when talking to the growers before the wedding. What would you say is a big trend in weddings at the moment? Probably my favourite trend is how brave brides are becoming. Breaking the mould of traditional choices and opting for much more artistic designs that works with the environment. Sometimes there is a piece that is so structurally perfect for the design but it is missed because its colour may fade into the background, or it may be the wrong colour for the design all together. In these cases I just love to paint them to show off their shape in a light that many people may have missed, metallics are fantastic for this. How can a bride create something really unique for her wedding? Does it have to break the bank? It's all about choosing the right combination of artists/ vendors of the industry and trusting their advice. You will know when you have found them because they are the people who will care enough to get to know you and make something truly unique to you. Be it flowers, a cake or even photography, the base product costs the same, the difference is the concept, how it is put together and the quality of product they are choosing. Find someone who's work speaks to you and trust they will create you something truly special. How do you manage sustainability within your business? We have to be conscious of the little things. I separate all the different wastes while we are working so we can easily compost green waste and recycle cardboard. Using local products wherever possible. But there are also things you don't even think about, Pampas Grass for example which all my brides seem to want is actually a noxious weed which can take over the native environment if not treated. This is why I will either use the native alternative or TREATED Pampas which prevents the spread of seeds while still allowing us to create the fluffy looks our brides dream of. What is the most out there creation you have made for a wedding or another event? Oh that would probably be the gilded tree sculpture I made for Nikea + Eds ceremony area. Nikea is a true creative and told me she was going to place a sculpture she made onto a tree which they would speak their vows under. I only saw sneak peaks of it and didn't really know what we were going to do until i saw it mounted on the tree, so the piece really was created as one with the environment. What is one trend in wedding flowers you’d like to see disappear? Jars with twine and hessian. If you like reading about tips from other industry insiders click here to continue reading.